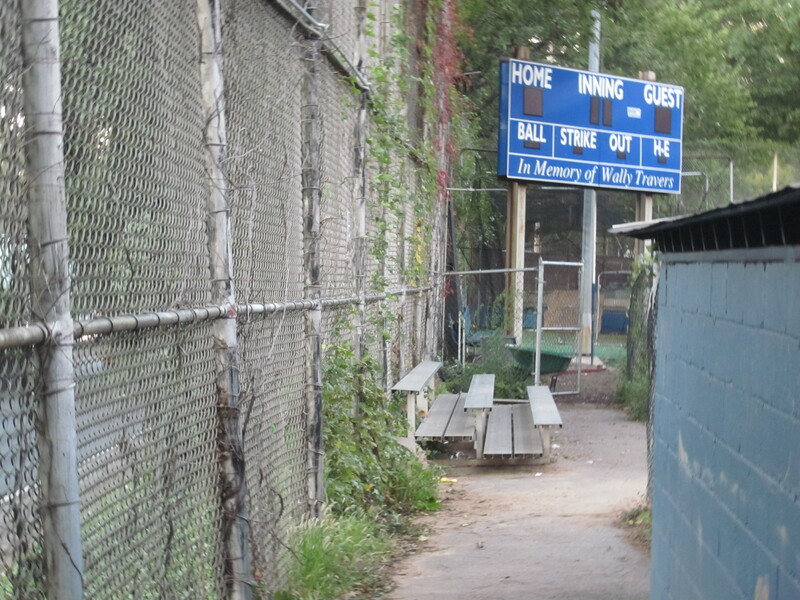 As I said in these pages about a month ago (New Year’s Penicillin), I’ve been spending a lot of time just off the 230th Street exit of the Major Deegan, sitting on crooked aluminum bleacher seats watching baseball on a small field. 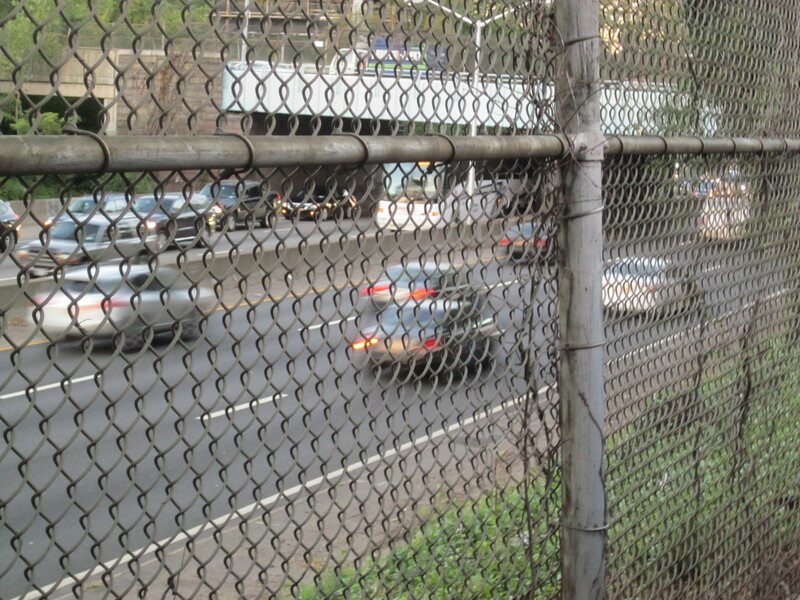 The field borders the Deegan and the hum of traffic is a constant. The bleacher seats: no admission charge. In between games or while waiting for the games to begin, I’ve become very familiar with the Kingsbridge neighborhood that surrounds the field. A café con leche at Malecon Restaurant has become a weekly treat and as I reported here, I “discovered” a 50 year old Kosher deli named Loeser’s where the penicillin includes chicken broth, noodles, or maybe a matzoh ball. More recently, as I waited for the games to begin, I happened on another place. 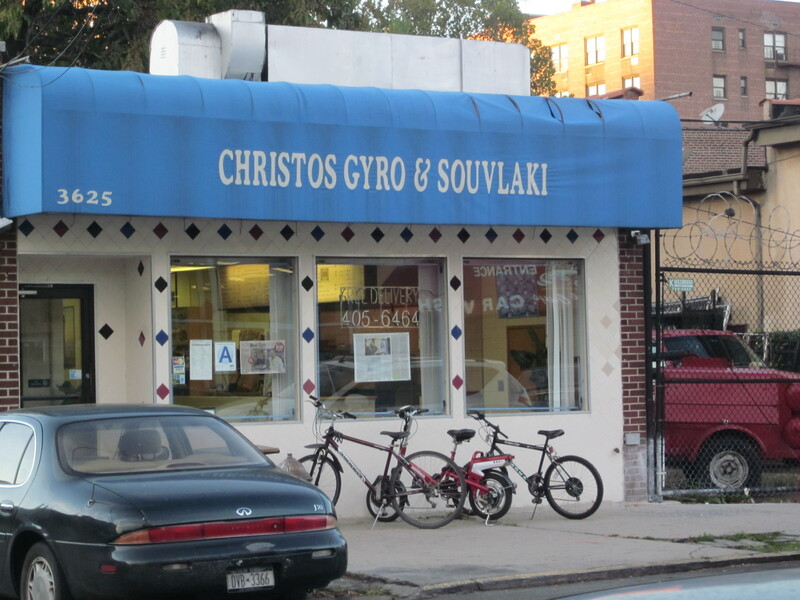 Just a few paces from the 50th police precinct and across the street from the Nice Guys Car Wash, I found a small, shed of a diner called Christos Gyro & Souvlaki. Christos, I learned, has been at its tiny location on Kingsbridge Road the past eight years—at least that was what the owner, Christopher, a.k.a Christos, said to me as he also proudly handed me a laminated Daily News article about his restaurant where that newspaper rated his gyro the best in the city. The weather was changing. An Indian summer day was quickly turning into a brisk autumn one. I’d have to take the Daily News’ word on the gyro. I wanted something else. 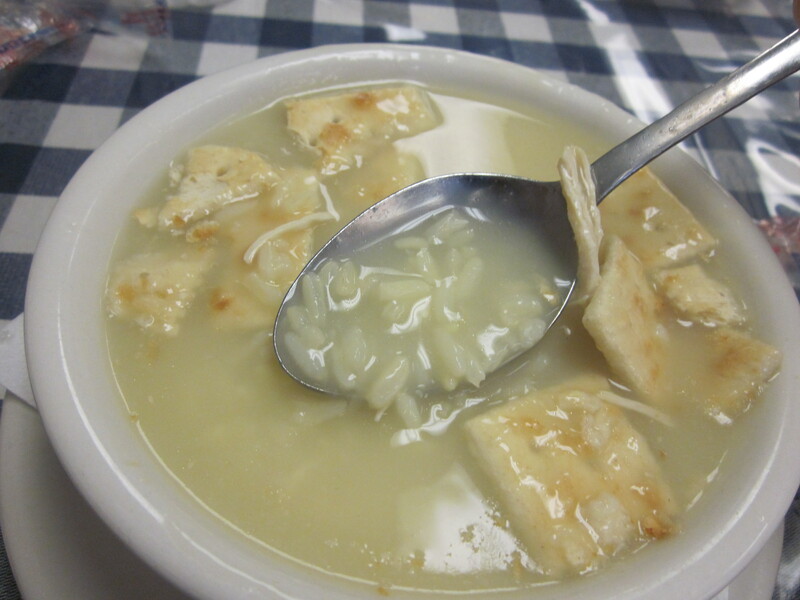 I didn’t need New Year’s penicillin, but the close Greek equivalent would do very well. “You want the avgolemono?” Christos asked. “Yes I do,” was my definitive response. “Moussaka,” I said, not caring that I might miss the beginning of the game. The bowl of the yellow-tinged, lemon chicken soup was steaming. Spherical dots of orzo floated within along with slivers of chicken. The distinct citrus snap of lemon meshed magically with the hearty, comforting chicken broth. I crumbled a few saltines into the bowl and slurped. It wasn’t long before the bowl was empty. 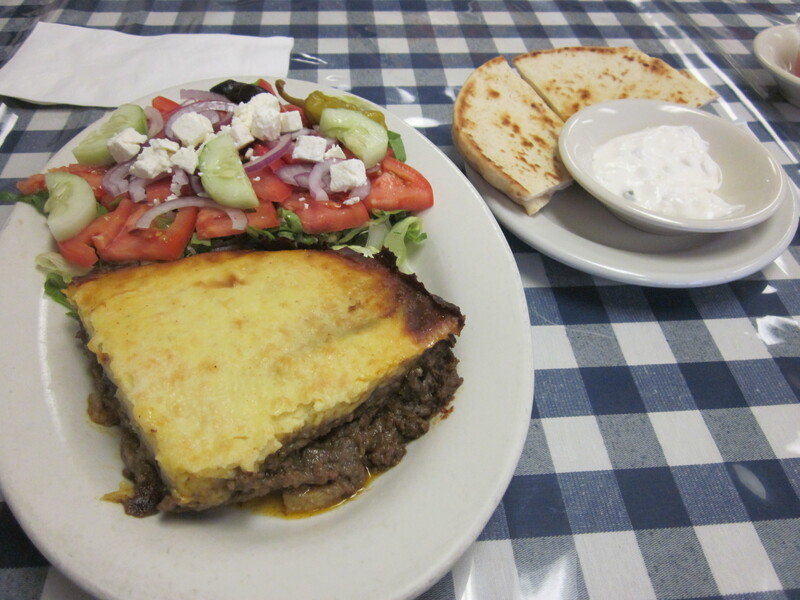 Moussaka awaited, paired with a simple Greek salad, pita bread and a generous bowl of tzatziki. I dipped the pita into the creamy, garlicky yogurt…and then I double dipped. The half inch of béchamel sauce on top of the ground beef and eggplant was airy, the filling scented with cinnamon. I alternated between bites of the moussaka and dips of the tzatziki until all was gone. Christos came to clear my table. “You did good,” he said. “I know,” I answered, happy to have made him proud. As I waited to pay, I noticed a tray of baklava and remembered reading in the Daily News piece that Christos’ wife made them fresh daily. I pointed to it. Christos’ son was working the cashier—Christo’s was most certainly a family affair. “To go?” he asked. I nodded and took the bagged baklava back to the ball field. I devoured it watching baseball on the bleacher seats while like a continuous loop, the music of the Major Deegan played on and on. Music to eat baklava by. Thank you for this post. I am Greek, I live in Riverdale and I had no idea of this place. Sounds tempting, I will definitely give it a try. Hope it reminds of home!